✔Convenient to Use, Easily Opens Most Jars with a Simple Twist. ✔Easy tearing, pulling, turning and twisting for anything you crave. ✔An Essential kitchen gadget set,multi-functional and helpful. ✔No More Aching Hands and Fingers, NO extra stress on your handIf. ✔If you are not satisfied with the item, we will REFUND or REPLACEMENT.Please feel free to contact us! Why Choose 4 Pack Set? Valued Set- we've created this all-inclusive bundle in order to help you save your time, money andeffort by combining all the essential accessories in 4 set! Best Companion in Kitchen -Open Jar/Bottle/Wine -now you don't have to call for help every time you want to enjoy yourfavorite jam or have a glass of wine! Before or after use, please wash it in time and keep it dry. HAND WASH recommended, storage in cabinet.Non-fireproof material. DO NOT BURN IT. Order Now and Enjoy 100% RISK-FREE SATISFACTION GUARANTEE! ✅4-IN-1 JAR OPENER: Ergonomic & non slip design with 4 different jar grips and inner rubber will give your hands the power to open any Jar lips just in squeeze. Easy tearing, pulling, turning and twisting for anything you crave. 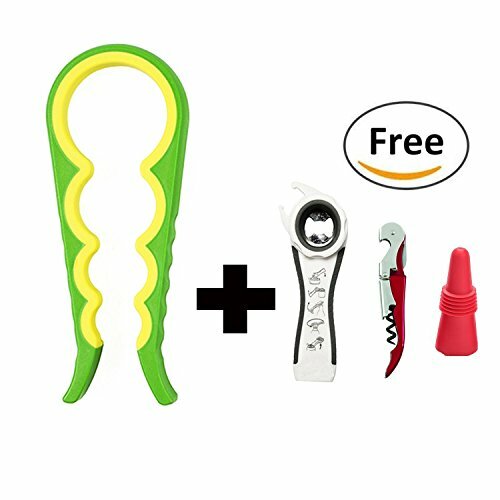 ✅5-IN-1 BOTTLE OPENER: Can open lips for the bean cans, covers of the pickle bottles & caps of the sodas & soft drinks. Easily twist off screw caps with a simple twist. Clamp down on food seals to instantly remove pull tabs. ✅PORTABLE WINE OPENER: Features integrated of wine opener and foil cutter, multifunctional and professional corkscrew. ✅SILICONE WINE STOPPERS: With sturdy plastic core and premium silicone cover, these stoppers will not break easily. ✅VALUE 4 PACK, LIFETIME WARRANTY: Nice kitchen gadget opener set，be good helper for chef at home. 100% MONEY-BACK Guarantee and LIFETIME Quality Warranty. If you have any questions about this product by W-K, contact us by completing and submitting the form below. If you are looking for a specif part number, please include it with your message.